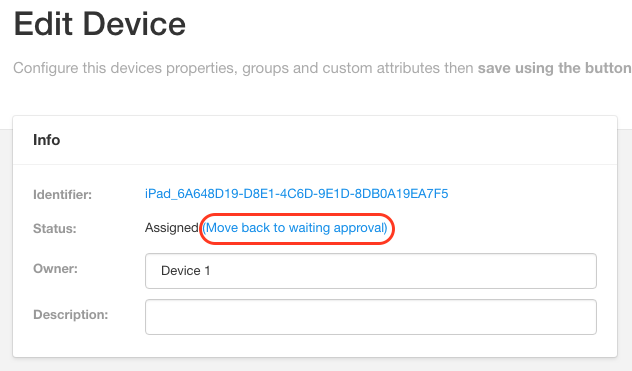 In this article we'll be covering how to move an assigned device back to "waiting for approval". In order to do this, all you have to do is go to your "Devices" page which you can access from your Dashboard - by clicking "Devices". Once you are there, you will see the edit device link next to each device. You will be taken to the "Edit Device" page. It is here that you will see the option to "Move back to waiting approval". Click on this link. At this point, a dialogue box will appear. Click "OK". And you will see that the button next to the device gives you the option to approve again. You can approve and unapprove whenever you wish, but keep in mind that each time a device is assigned to the account, charges are going to be incurred. For more information on billing, check out the Billing FAQ article here. This concludes our overview of moving a device back to "Pending" status. If you have any questions or comments feel free to send us a message at support@devicemagic.com or leave us a comment below.